Maria Teresa Rafaela of Spain (María Teresa Antonia Rafaela; 11 June 1726 – 22 July 1746) was an Infanta of Spain by birth and was later the wife of Louis, Dauphin of France, son of Louis XV of France. She died aged 20, three days after giving birth to a daughter who died in 1748. Born at the Royal Alcazar of Madrid in Spain, she was the second daughter of Philip V of Spain and Elisabeth Farnese. Baptised María Teresa Antonia Rafaela she was an Infanta of Spain (infanta de España) by birth and was granted the style of address of Royal Highness. She was known as María Teresa Rafaela though sometimes just Maria Teresa. Prior to her marriage, the Spanish and French royal courts had been on poor terms: the Spanish had been greatly insulted by the French in 1725 when the engagement between Louis XV of France and Infanta Mariana Victoria of Spain, elder sister of Maria Teresa, was broken off. Louis XV had instead married Marie Leszczyńska and by her fathered the Dauphin, Louis. The marriage between the Infanta María Teresa Rafaela and the Dauphin was announced in August 1739 after the marriage of Princess Louise Élisabeth of France (sister of the dauphin) and Infante Felipe of Spain (brother of María Teresa Rafaela) the same month. Under the influence of her mother Elisabeth Farnese, María Teresa Rafaela was not to go to France until she reached a more mature age. The Infanta was married to the dauphin by proxy in Madrid on 18 December 1744 and departed Spain in January 1745. 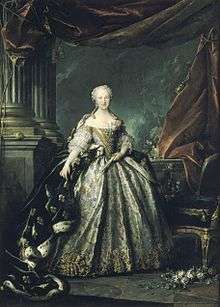 She arrived at Versailles on 21 February 1745. The official marriage took place at the Palace of Versailles on 23 February 1745 and was performed by the Cardinal de Rohan. In France she was known as Marie Thérèse Raphaëlle d'Espagne or de Bourbon. 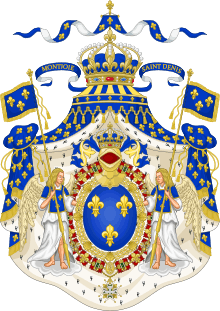 The marriage was intended to improve relations between the cousin courts of France and Spain; during the infancy of Louis XV, he had been engaged to Maria Anna Victoria of Spain, oldest daughter of Philip V of Spain. The betrothal had been broken off and relations between the two countries had been cold. This latest union was meant to improve links between them both. Addressed as Madame la Dauphine at Versailles, Maria Teresa Rafaela was the highest ranking female in the kingdom after Queen Marie. She was the first Dauphine since the 1712 death of Marie Adélaïde of Savoy. On 24 February the "Ball of the Clipped Yew" was held in honor of the newlyweds. The event also marked the arrival of Madame de Pompadour at Versailles. The ball was attended by the king, the queen, Madame Henriette, Madame Adélaïde; the Duchess of Chartres the Dowager Princess of Conti and the Duchess of Modena along with other princesses of the Blood. The marriage did not get off on a good start as it was not consummated on the first night. This was a major embarrassment to the young dauphine and as a result her position at court was undermined. Despite this, she had a good relationship with the king and queen, and her husband fell quickly in love with her. Although the dauphine was described as beautiful, dignified, pious, and well educated, negative remarks were made because of her red hair. Her shy nature further isolated her from the court and she was openly hostile to the king for his affair with Madame de Pompadour. The Dauphin and Dauphine disliked the royal mistress for the way she drew attention away from Queen Marie Leszczyńska. Finally, the marriage was consummated in September 1745, ending court gossip. The couple became very close and devoted to each other spending most of their time together. On 19 July 1746 at Versailles, Marie Thérèse Raphaëlle gave birth to a daughter. Her death on 22 July caused an intense sorrow to the Dauphin, which persisted into his second marriage. Louis XV had to physically drag his son away from the death bed of his wife. To make matters worse the Dauphine´s Father King Philip V of Spain died just 13 days before her on July 9. The child was baptised Marie Thérèse and was styled as Madame Royale but died at Versailles in 1748. Marie Thérèse Raphaëlle was buried at the Royal Basilica of Saint Denis, the French royal necropolis outside Paris on 6 August 1746. At her death, her half brother, Ferdinand VI of Spain, proposed that the Dauphin marry her sister the Infanta Maria Antonia Fernanda but Louis XV refused. The following year, her husband married again to Princess Maria Josepha of Saxony a daughter of Augustus III of Poland and Maria Josepha of Austria by whom he had some seven children including the future Louis XVI. When the Dauphin died in 1765, he requested that his heart be placed beside the grave of Marie Thérèse Raphaëlle. Princess Marie Thérèse of France (19 July 1746 – 27 April 1748). 1 2 van de Pas, Leo. "Infanta María Teresa Rafaela of Spain". Genealogics .org. Retrieved 2010-09-10.